Tuesday night marked TE School District’s first Finance Committee meeting of the new school year. Although I was unable to attend the meeting, my friend Ray Clarke did attend the meeting and shared the following notes from the meeting. Thanks Ray! – Finance committee approval of the Preliminary Budget is due in just three months. After some discussion about teeing up review of opportunities in the district’s self insurance of its health plan and potentially of some special education risks, Doug Carlson requested that the Administration present the Committee with full district budget scenarios that start with expenses managed to revenues with no tax increase. Hopefully we’ll get more than the standard operating procedure showing a $6 million deficit. – By the way, somehow in an environment of last 12 months US inflation of 0.2%, the Act 1 index is 2.4%. Half of the index is the increase in the Federal school employment cost index, showing how contract awards get baked into future taxes. – August YTD expenses/encumbrances are up across the board, total up 12% versus last year, driven by special ed instruction up 32% (over $3 million) YTD. I don’t recall the explanation for this but I didn’t hear any immediate concern that the overall 5% budgeted expense increase would be exceeded. One number that does stand out for the full year budget is the $770,799 (11%) increase in the Administration budget. – For those of use that liked to do a quick scan of the month’s check register from high to low, the task has been made harder by a switch to reporting the check register by pay period in alphabetical order. This seems arbitrary; when asked why, no reason was provided. – The actual results for last year are still months away, awaiting the external audit. The Business Office is working through the encumbrances and deciding what should be released; an interesting exercise, no doubt. – Restricting part-time employees to 27.5 hours has caused a significant shortfall in the number of teachers/aides available to support the after-school homework clubs, and this is becoming a real problem with the clubs usually starting up in October. Part of the program is funded by FLITE, which is not able to contract with employees of our out-sourcing company, CCRES. The District is looking to advertise specifically to hire homework club leader and assistant positions at $28 and $17/hour, which FLITE would apparently be able to continue to fund. – Kris Graham brought up the need to fully air condition all of the elementary and middle school buildings in the light of the current heat wave. She did not offer a cost estimate for this. Residents also learned on Tuesday that the Tredyffrin supervisors voted to declare the township a state of emergency for the upcoming Pope’s visit, citing expected traffic and congestion. According to Police Supt. Giamio, there will be over 16,000 train riders during the pope’s visit and that the highest number are expected to use the Paoli station! Yikes! As an aside, I am glad about my decision to move the annual historic house tour up a week to Saturday, Sept. 19 (www.tredyffrinhistory.org) to accommodate the Pope’s visit. We should plan around the Pope’s visit as if the weather people were predicting a blizzard — get to the grocery store and don’t forget your medication before the storm hits (or rather, the Pope lands). The TE School Board candidates were asked to answer the following question in 500 words or less. Although there are many important issues facing the TE School District, what one issue will you focus on should you be elected? As a school board director, what in your background, experience or education prepares you to help with this specific issue. The four candidate responses follow below in alphabetical order according to last name. If your question and/or comment is for a specific candidate, please refer to that individual by name so as not to confuse. Voters will select two of these candidates in November for the school board. Thank you for the opportunity to introduce myself. I’m Michele Burger, School Board candidate for Region 2. My family and I moved to the Glenhardie neighborhood in Wayne 17 years ago. As parents of three young children, we considered a number of communities but chose Tredyffrin because of its nationally ranked schools. We are very pleased that we did. All of our children have received excellent preparation for college and beyond. Over the past 15 years, I have volunteered Mat every level of my children’s schooling including serving as PTO president at Valley Forge elementary. I have actively participated in monthly School Board meetings as well as finance and facilities subcommittee meetings. I have been a community activist and liaison regarding School Board decisions that impact residents of Region 2. These experiences have afforded me the opportunity to work with many different committees, levels of school district personnel, township personnel, and community members. In every instance, I strove to maintain open communication, to look for creative solutions when needed, and to consider our tax burden and District spending priorities. With my degree in Business and my professional career as a manager of a large sales force, I have experience with negotiating employment contracts, setting measurable goals, and managing budget expenditures. If I were to only focus on one issue that is important to me, it would not be a true picture of how I would approach my responsibilities on the School Board. There are a number of key standards that I will uphold, if elected. 1) I will work to maintain the highest quality education for all students at an affordable price to taxpayers. 2) I will establish better avenues for open communication and transparency. This would include but is not limited to posting community questions and school board responses online. 3) I will gather community, student, teacher, and administrators’ input as well as the views of fellow school board members prior to making fiscal and educational decisions. 4) I will fight to eliminate Keystone exams as a graduation requirement. With these standards in mind, the one “issue” that I will give extra focus to is the District’s spending priorities. Over the past several years, I have a track record of questioning the District’s spending – especially the $4 million maintenance building that was recently approved. 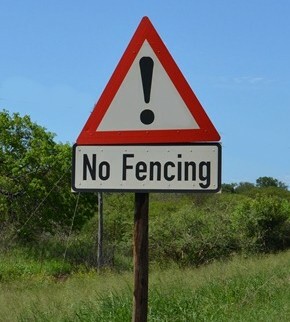 I have questioned the need for security fencing that provides no real security and has an impact on homeowners whose properties are adjacent to our schools. With the help of others, I was able to stop the destruction of the VFE tennis courts, a valuable community resource, which in fact saved money and allows the PTO and School District to generate revenue through usage fees to outside organizations. If elected, I will utilize my business background, my track record of questioning the District’s spending priorities, and my key standards as guiding principles to serve students, employees, and taxpayers of the Tredyffrin-Easttown School district. For additional questions, please contact me at burger4sb@gmail.com or 484-254-6515. I, Kris Graham, have the privilege to currently serve as president of the Tredyffrin Easttown School District. I spent forty years as a classroom teacher. I am a wife and a mother of two adult sons – both Conestoga graduates. I treasure two grandchildren and my husband and I nurtured eleven foster children over a dozen years. They too benefitted from the TE schools. I have served for three and a half years on the T/E School Board chairing the Legislative and Education Committees, two years as vice-president, and led the Negotiation Team and the Superintendent Search Committee. My advanced degrees in education and teaching certificates in multiple areas enables me to work three mornings a week at a local school that serves at risk adolescents and maintain a private tutorial practice. I also commit to maintaining Conestoga among the elite high schools in the United States as recently recognized by BestColleges.com. I enjoy meeting you as I knock on doors, attend school functions and civic engagements. I look forward to working with this supportive community, sharing our TE pride, and continuing the TE legacy of academic excellence! Pattye Benson has laid down a real challenge: state what is the one most pressing issue facing the school board and what are my qualifications to address it. Check out my Facebook EdSweeney4TE to review specific reform issues I am proposing in various areas, such as restoring applied technology and languages in elementary school, combating drug use, and using a more “user friendly” model for public comment. Let me introduce myself. My name is Ed Sweeney and I am a local attorney who fights on the side of people like yourself. I will fight, effectively, for Tredyffrin’s interests and Region 2’s interests. My wife, Franny, and I have an 8 year old at VFES, Katie, and Franny volunteers regularly as a “library mom” and records the children singing. For 20 years, I have tried to develop my volunteer leadership skill sets to effectively and efficiently obtain results in areas including government, church (Saint Isaac’s), charitable, and political venues. This includes 15 years on volunteer Boards in Tredyffrin’s government, including Planning Commission and Zoning Hearing Board. 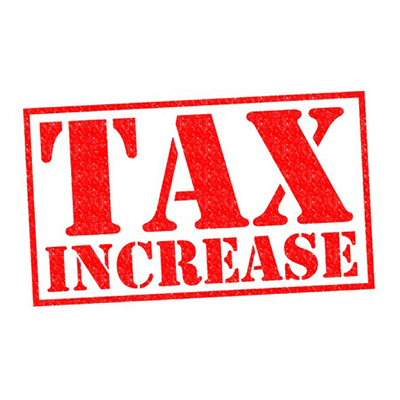 I have fought vigorously as a political leader to keep Tredyffrin affordable and competitive, and against budget busting school taxes and the PIT and EIT. Our focus needs to be keeping Tredyffrin affordable for middle class families while improving the already fine academic quality in the School District. We are not high priced Radnor. The mistake Radnor and other school districts have made is placing scarce resources in building schools or on administrative costs. We are drifting down a risky path of borrowing $24 million of capital without specific publicly articulated goals, installing expensive fences that bring little safety value, and a $4.8 million maintenance facility that is twice its forecast costs. 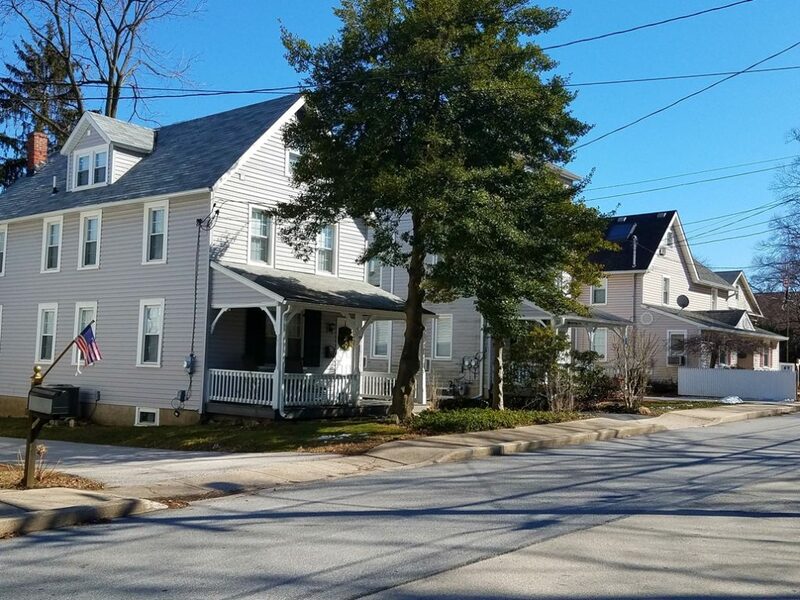 I agree with the comment: “no one likes to see money spent on facilities and not the students.” The ability to make our total local tax obligations affordable makes Tredyffrin attractive to businesses which pay crucially important transfer taxes. Affordability also is a magnet for families that chose to settle here based on value. Our philosophy should focus expenditures on students and teachers. We should treat our employees fairly. Transparency and effective public contribution help keep our system working well and is an important check on government. Tredyffrin residents should also speak with one bipartisan voice on Pension Reform for new employees. The Pennsylvania School Board Association (PSBA’s) has urgently declared that “the system is unsustainable and must be fixed now.” I am in favor of a mixed system compromise as recently proposed. 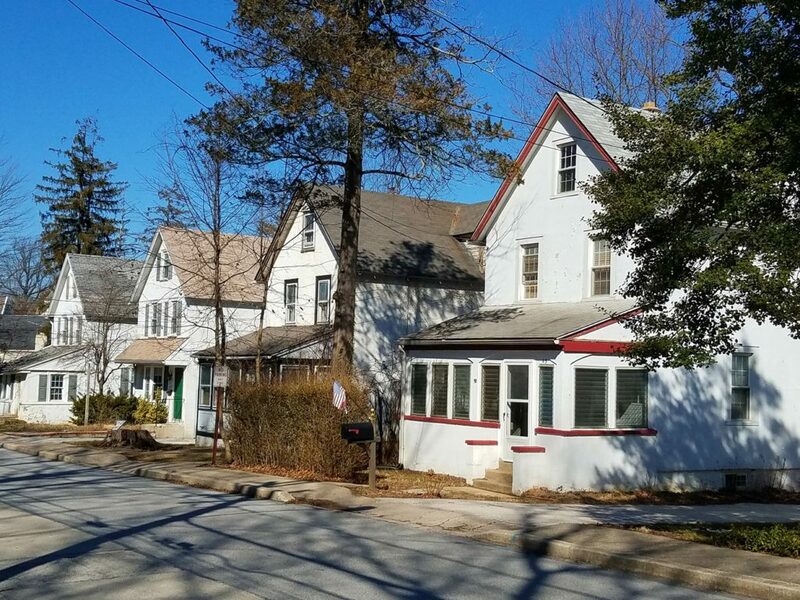 Given the current dynamics of the Board, we need Directors who fight skillfully for Tredyffrin’s priorities both in public and “behind the scenes.” As a PC member, I opposed with success proposals harmful to homeowners such as trying to make residents put in sidewalks and expanding the definition of “historic building” to apply to even post war homes. Experience matters in a Board setting. I am dedicated to earning your support. Learn more about me on Facebook: EdSweeney4TE. Hello. 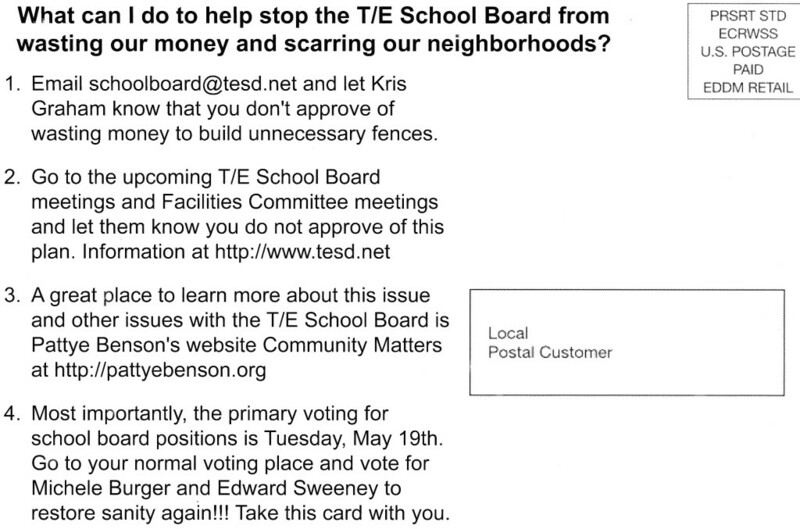 My name is Alan Yockey and I am a candidate for TESD School Board Director. I have spent 40 years in Information Technology as a programmer/analyst, business consultant, and IT Director. Before that I was a mathematics teacher. I know firsthand the rewards and frustrations of education. Now I am retired and have the time and experience to use serving our community on the school board. 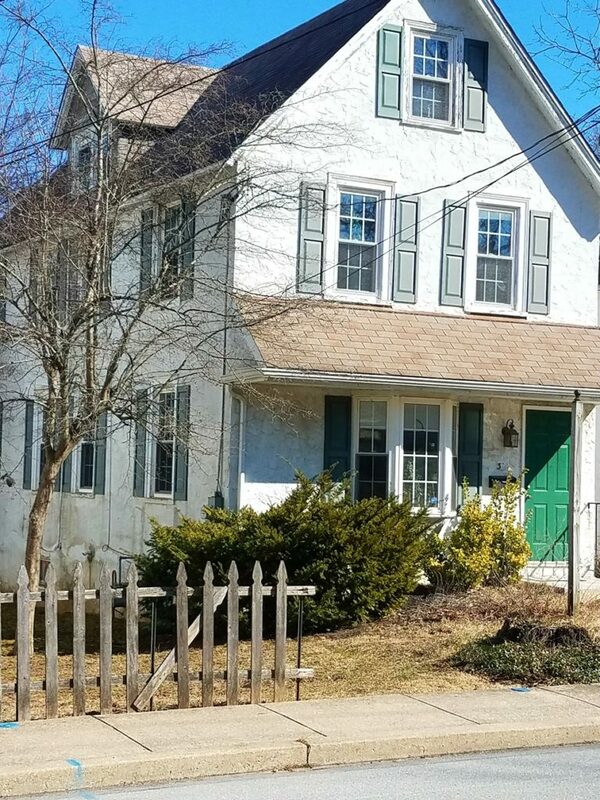 We moved to Tredyffrin in 1994 when our son was starting kindergarten at Hillside. He graduated from Conestoga in 2007. I know the schools are excellent, and I would like to serve our community to maintain that excellent quality. The first priority of any school board director should be to maintain the high level of excellence in our district. I will approach this on several fronts. Insure our teachers get the training and support to make them excellent in the classroom. Monitor class size. Reduce constraints imposed on teachers from standardized testing. The number one objective for teachers should be opening minds and developing critical thinking. Not having high scores on multiple choice tests. Involvement of the Community-Whether in academics, finances, art and cultural, or sports the school board needs to lead the way in providing opportunities for parents and community members to be involved. Put more material on the web. Require committees to schedule meetings both during the day and in the evening. Have more workshops like the budget workshops which both provide information and allow for citizen input. Put questions, responses and supporting material for citizen questions on the web. Agendas items should be sufficiently clear so that interested parties can be easily identified. Students-Prepare students to be well rounded adults. Make sure all students are exposed to academics, music, art, manual skills, etc. The goal is to allow every student to find their area of interest and excellence. We cannot measure the success of the schools by counting the number of students who are National Merit Scholars. Finances-Work with the administration to balance our resources among the complex mandates and demands levied on the schools by government, by the community, by the students, and by the teachers. Use my 40 years of analytical experience to evaluate needs and costs. Think long term. Do not make decisions today which will hurt the quality of our schools in the future. Producing “Well rounded adults or citizens” is a goal for our education system and for parents and for the community. For our education system to succeed at this goal we need school board members who take a holistic approach to the school system. As an IT Director I balanced end user demands, budget, IT and end user resources, training requirements, government regulations, safety concerns, and corporate goals to achieve an optimum solution. I will do the same on the school board. In November, voters in the TE School District will go to the polls to select five school board directors. People bring different backgrounds and qualifications to the job of school board director and as voters; we need to make the right choices on Election Day. I asked that the candidate’s response “not to be a political campaign plug or a laundry list of school district issues”. Their personal response was to “(1) focus on ‘one’ issue that is important to you and (2) to explain how your background/experience qualifies you to tackle this issue. All TE School Board candidates were invited to send a response not to exceed 500 words by August 1. After reading the responses from the candidates, you be the judge whether or not the candidates successfully answered the question. Since many of the candidates spoke of transparency and communication with the public, it will be interesting to see if they respond to questions or comments. I would ask you to remember, that these candidates are our neighbors — they are one of us – and I ask that all comments/questions be respectful and not personal attacks. In the Tredyffrin, District 1 school board race, Dr. George Anderson withdrew from the race; therefore, his statement will not be included. On July 30, Neill Kling announced his candidacy to replace Anderson in a Tredyffrin, Region 1 candidate. With the receipt of Kling’s response today, I can now say that all ten candidates have provided a response for Community Matters. Note: There are 2 seats available in Tredyffrin, Region 1. The two candidates receiving the highest number of votes in November win. Colligan and Kling endorsed by Tredyffrin Township Republican Committee; Hotinski and Kantorczyk endorsed by Tredyffrin Township Democrats. Note: There are 2 seats available in Tredyffrin, Region 2. The two candidates receiving the highest number of votes in November win. Burger and Yockey endorsed by Tredyffrin Township Democrats; Graham and Sweeney endorsed by Tredyffrin Township Republican Committee. Note: There is 1 seat available in Easttown, Region 1. The candidate receiving the highest number of votes in November wins. Murphy endorsed by Easttown Township Republican Committee and Reardon endorsed by Easttown Township Democrats. Primary Election 2015 was yesterday and Chester County Voter Services has now calculated the results. Tredyffrin Township has 9,003 registered Republicans and 8,146 registered Democrats. For Primary Day, it was nearly a dead heat of Republicans and Democrats showing up to vote. Approximately 17.8% of the registered Democrats voted (1,447 voters) and 17.7% of the registered Republicans voted (1,596 voters) yesterday. 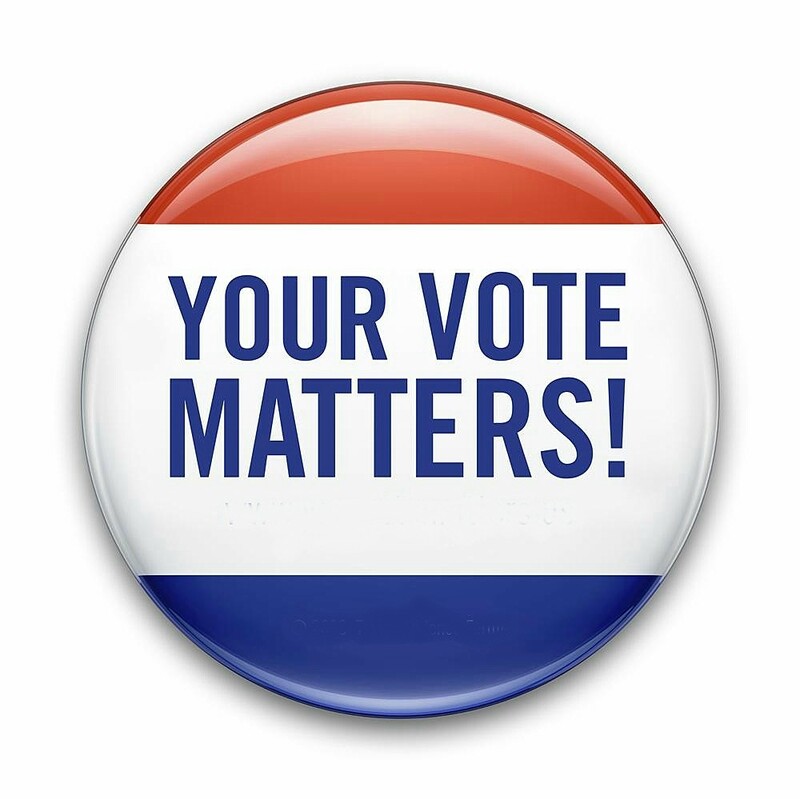 If you want your vote to matter, you have to vote! Two at-large seats are available on the Board of Supervisors and no incumbents are in the race. Republicans Mike Heaberg and Kristen Mayock are current at-large supervisors and are not seeking re-election. Both having previously run unsuccessfully for the Board of Supervisors, Moir and Lukens received the highest number of votes in yesterday’s Primary Election. Political newcomers, Democrats Bankins and Horvath followed closely behind Moir and Lukens in total votes. Currently serving Western District supervisor John DiBuonaventuro is not seeking reelection. Both newcomers to the municipal supervisor races, Van de Krol received the highest number of votes in the Primary Election. The District 1 supervisor race has a re-match between Tredyffrin Township Planning Commissioner chair Tory Snyder(D) and Paul Olson(R), the longest-serving supervisor in the history of the township. If you recall, in 2011, this particular supervisor race was extremely close with only 13 votes separating them in the General Election. For Primary Election 2015, Olson received only two more votes than Snyder. It doesn’t get much closer, it’s going to be interesting to see what happens over the next 6 months. For many people, the Board of Supervisor races have taken a backseat to the TE School Board races. Five of the nine seats on the school board are available. Four Board members, Karen Cruickshank (D), Pete Motel(R), Jim Bruce(R) and Liz Mercogliano(R) are not seeking reelection. The fifth available school board seat is held currently by Board President Kris Graham(R) who is seeking reelection. 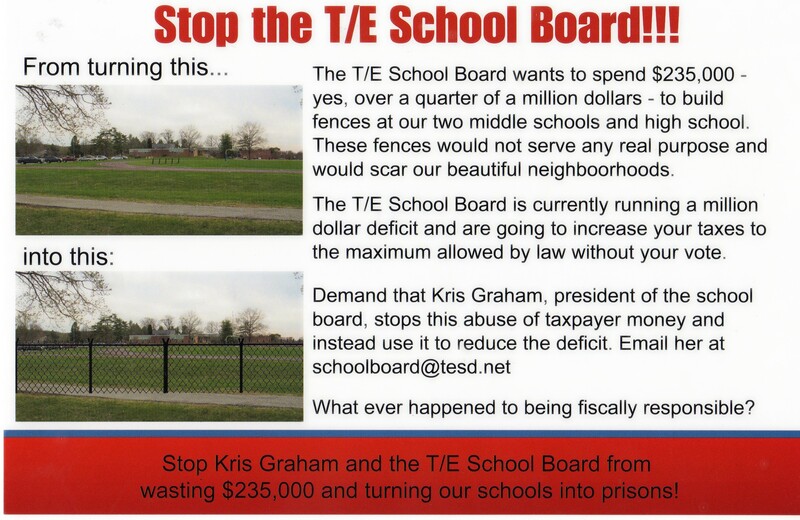 The unresolved school fencing issues, the very expensive $4 million + maintenance building and the outsourcing of the aides and paraeducators are just three school district issues that recently have had some of us questioning the decisions of the current school board. The Primary Election results indicate an interest from the community in ‘change’, particularly the numbers in Tredyffrin, Region 2. In the only school board race with an incumbent, Democrat Michele Burger has a commanding lead, with more than 200 votes separating her and Republican Ed Sweeney, with incumbent Kris Graham(R) in third place. With only two seats available in Region 2, if the General Election were held today it would mean that incumbent Kris Graham would no longer be sitting on the school board. Two positions on the school board are available in Region 1. All political newcomers, the Democratic candidates Roberta Hotinski and Todd Kantorczyk received the two highest vote totals in the Primary Election. In addition to the Region 1 and Region 2 seats in Tredyffrin Township, Region 3 in Easttown Township has one seat available. Currently serving school board director Dr. Pete Motel(R) is not seeking reelection. The Primary Election results for Easttown, Region 3 have Republican Kate Murphy receiving 610 votes and Democratic Fran Reardon receiving 268 votes. Reardon did not cross-file. Although both Murphy and Reardon themselves are newcomers to the school board races, Murphy is the daughter of a well-known local political family, Steve and Carol Aichele. Steve Aichele served as the Chief of Staff for former PA Governor Tom Corbett. Carol Aichele served as Secretary of the Commonwealth under Corbett and previously served as a Chester County Commissioner and TE School Board member. The results of the Region 2 School Board race should be a message not just to incumbent Kris Graham but to the entire school board. More and more people are ‘tuning in’ as to what is going on and do not necessarily support some of this Board’s decisions. Whether it is the increasing taxes, school fencing, outsourcing of District employees, an over-priced maintenance building, lack of transparency, etc. – these votes reflect a desire for change. The Board needs to accept that this is no longer a ‘few discontents’ but that more and more residents are paying attention and are troubled by some of their decisions. It will be interesting to see if the Primary Election proves to be an indicator for what we will see in November. It is six months until the General Election and much can happen between now and then, particularly with the addition of the Independent voters. 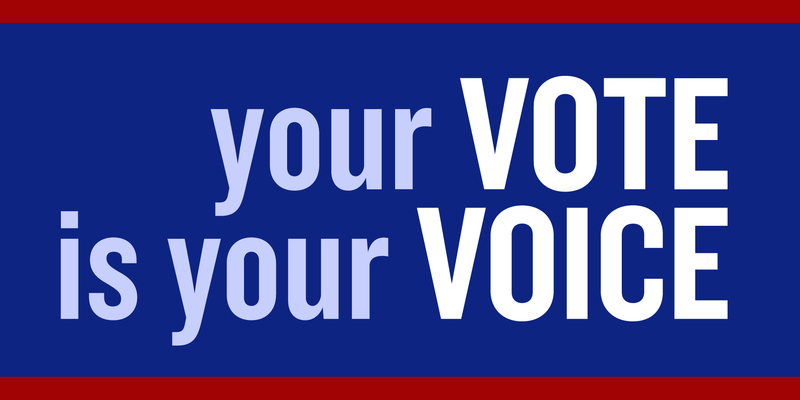 Pennsylvania does not allow Independent voters a voice in the Primary Election but come November, our votes will count! I am sure that the local political analysts will have more to say on the Primary Election results and I welcome the discussion. In closing, I have to include this photo from Primary Day. I ran into the Democrat and Republican chairs (Kathleen Keohane and Neill Kling) at Our Lady of the Assumption, one of the voting locations yesterday and they generously posed for this photo. Although I’m delighted to include it here on Community Matters, I challenged each of them to include it on the respective websites! 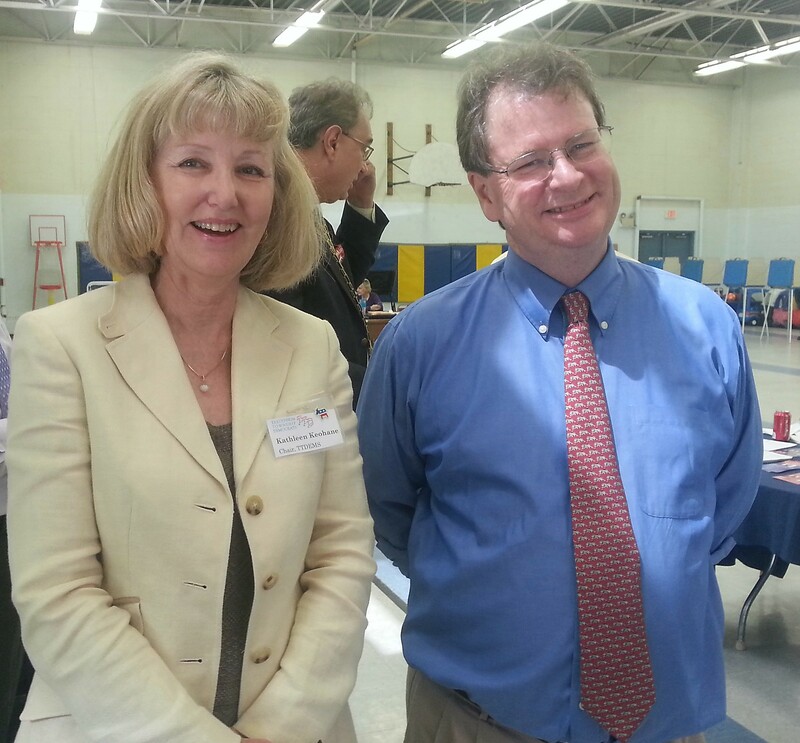 Kathleen Keohane, Tredyffrin Democratic Party Chair with Neill Kling, Chair of Tredyffrin Township Republican Committee on Primary Election Day, Our Lady of the Assumption.